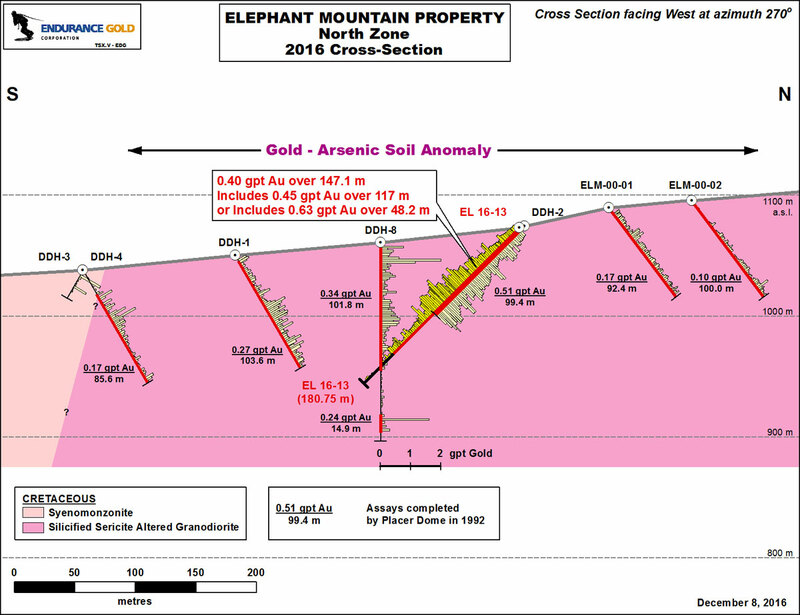 Endurance Gold Corporation (EDG - TSX.V, "Endurance") is pleased to announce further assay results from the 2016 drill program on its 100% optioned Elephant Mountain Gold Property in Alaska, located on roads about 76 miles (123 kilometres ("km")) northwest of Fairbanks. As announced on September 27, 2016 three (3) diamond drill holes were completed on the South Zone and one diamond drill hole was completed on the North Zone for a total of 598 metres ("m") drilled. 1.4 km north of the South Zone discovery (announced on October 31, 2016), drilling at the North Zone has successfully confirmed a wide intersection of 0.40 grams per tonne gold ("gpt Au") over 147.1 m including a 0.63 gpt Au over 48.2 m confirming the existence of gold-rich alteration system associated with elevated arsenic. At this North Zone Target, intermittent exposures of outcrop define a one square km alteration zone on surface consisting of disseminated pyrite-arsenopyrite in pervasively silicified, sericite, and clay altered granodiorite associated with a gold-arsenic soil anomaly. This area was previously drill tested by Placer Dome Inc. and others ("PDI") in which a drill section of six drill holes indicated a large volume of rock exceeding 550 m across and 100 m vertical depth that exceeded 100 parts per billion ("ppb") gold, hosted in pervasively silicified, sericite, and clay altered granodiorite similar to alteration and mineralization observed on surface. The North Zone drill section with histogram gold results is attached to this press release or can be viewed at www.endurancegold.com. Endurance completed one diamond drill hole EL 16-13 (Az 180 Dip-45) which tested the slightly higher grade core of the prior drill section within this broad low-grade zone. EL 16-13 was drilled to a total angled depth of 180.75 m and encountered silicified and phylllic (sericite) altered granodiorite throughout the entire core length. About 150 m of this length, starting at surface, encountered up to 1.5% pervasive disseminated pyrite and arsenopyrite with arsenopyrite and pyrite bearing quartz veinlets. The entire length of the drill hole is in-part oxidized with the oxidation related to fractures and oxidized quartz-sulphide veinlets. 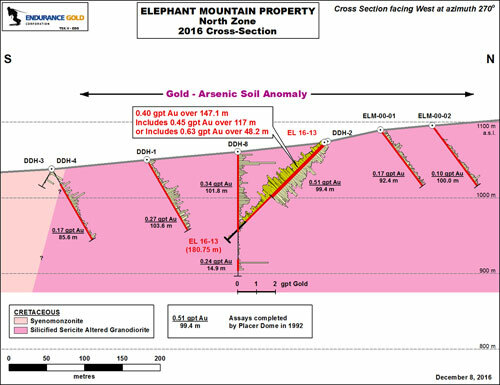 Assay results are 0.40 gpt Au over 147.1 m including a 0.63 gpt Au over 48.2 m. True width is currently unknown although correlation of the greater than 0.50 gpt gold mineralization for the North Zone drill section shows an apparent sub-horizontal orientation. A PDI drill hole located at approximately the same location as EL 16-13 returned an average grade of 0.514 gpt Au over an interval of 99.4 m.
South Zone - The South Zone drill hole EL 16-15 (Az 055 Dip-45) which underlies the western portion of the South Zone soil anomaly, intersected a wide oxidized and disrupted zone which includes multiple areas of faulting, brecciation and clay gouge. Only about 68% of the core was recovered for the entire 114 m length of the drill hole EL 16-15. The best assay results from this drilling include an intersection of 0.52 gpt Au over 3.04 m which includes 1.13 gpt Au over 1.06 m. This intersection is associated with one of the zones of clay gouge breccia and fault rubble and 24% of the core was not recovered through this interval suggesting possible loss of oxidized mineralization. The South Zone drill hole EL 16-16 (Az 235 Dip-45) is located on the east side of the South Zone soil anomaly 249 m north west of EL 16-14 and intersected primarily syenomonzonite, minor diorite, with veinlet zones throughout its entire length with some inliers of altered sediments. The best assay results from this drilling include intersection of 0.59 gpt Au over 2.44 m and 0.48 gpt Au over 2.44 m. These intersections are associated with minor pyrite and arsenopyrite associated with a quartz veinlet zone in syenomonzonite and a clay gouge zone in silicified and carbonate altered diorite and sediments. It is now interpreted that this hole was collared too far to the west to intersect the interpreted northwestern strike extension of the EL 16-14 South Zone discovery. Expansion of Property - The Elephant Mountain Property was expanded through the staking of three additional Alaska state mineral claims in September 2016. Future Plans - A program of geophysics, soil geochemistry and diamond drilling will commence the planning stages over year end. Drill holes EL 16-14A/B and EL 16-16 have only been selectively sampled based on visual arsenopyrite and/or stibnite mineralization. As part of the winter phase of the program, further splitting and sampling of these drill holes may be undertaken to evaluate unsampled zones of vein stock work and low-suphide silicification.